APCH/DEP SVC PRVDD BY LOS ANGELES ARTCC ON FREQS 124.85/319.2 (SELIGMAN RCAG). COMMUNICATIONS PROVIDED BY PRESCOTT RADIO ON FREQ 122.1R WHEN ATCT IS CLOSED. A11 DEPT OF TRANSPORTATION ADMINISTRATIVE SERVICES DIVISION. A110-1 PART 77 OBSTNS-TREES BOTH SIDES OF RWY. A110-3 HVY VOLUME OF AIR TAXI FLIGHTS INVOF GRAND CANYON. NOTE: SEE SPECIAL NOTICES GRAND CANYON SPECIAL FLIGHT RULES AREA. A110-4 RWY 03/21 LGTD DISTANCE REMAINING SIGNS ON E SIDE. A110-5 ARFF INDEX B AVBL WITH 24 HR PPR CALL AMGR 928-638-2446. A24 OVERNIGHT PARKING FEE & COMMERCIAL LNDG FEE. A70 FUEL AVBL 24 HRS CALL (928) 638-7117. 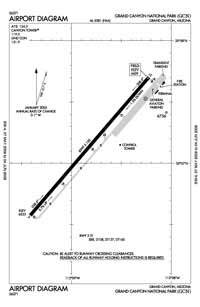 A81-APT ACTVT MIRL RWY 03/21 - CTAF WHEN ATCT CLSD. ACTVT PAPI RWY 21 - CTAF. Dual Wheel Landing Gear: 108.